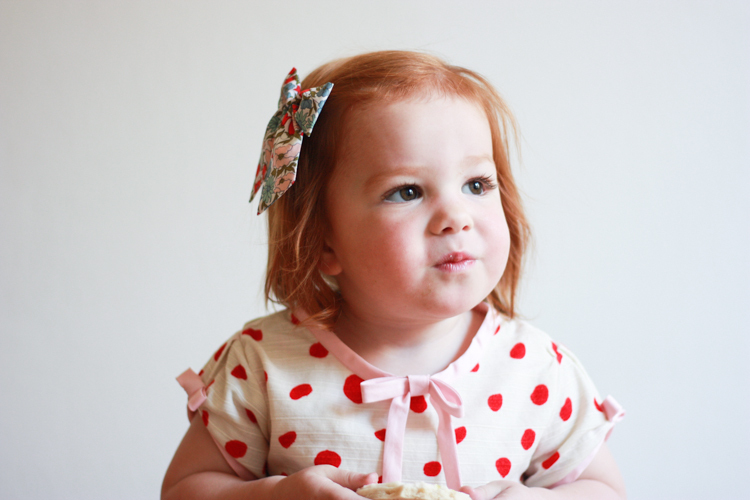 I’ll never tire of sewing for this little lady, and holidays seem like a fun time to create something special (aka there is a deadline so I actually get it done!) 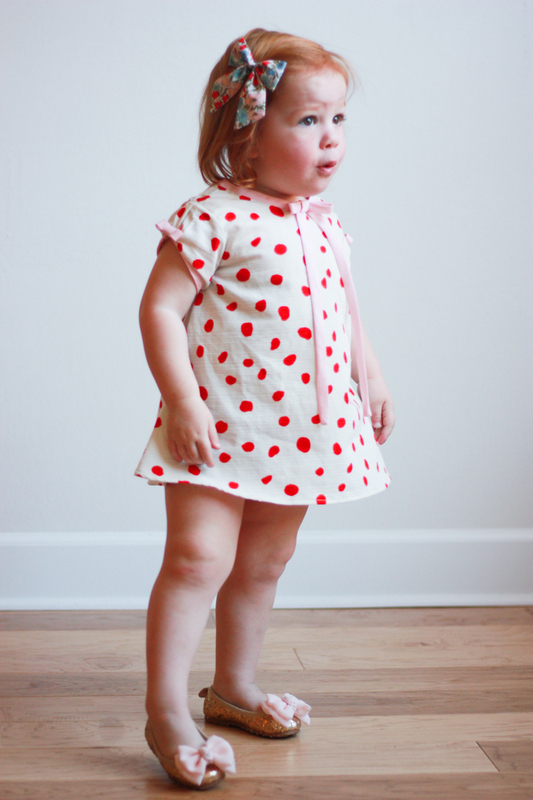 I created this little polka dot swing dress as a Valentine’s dress, and the vintage vibe and cut are especially festive. 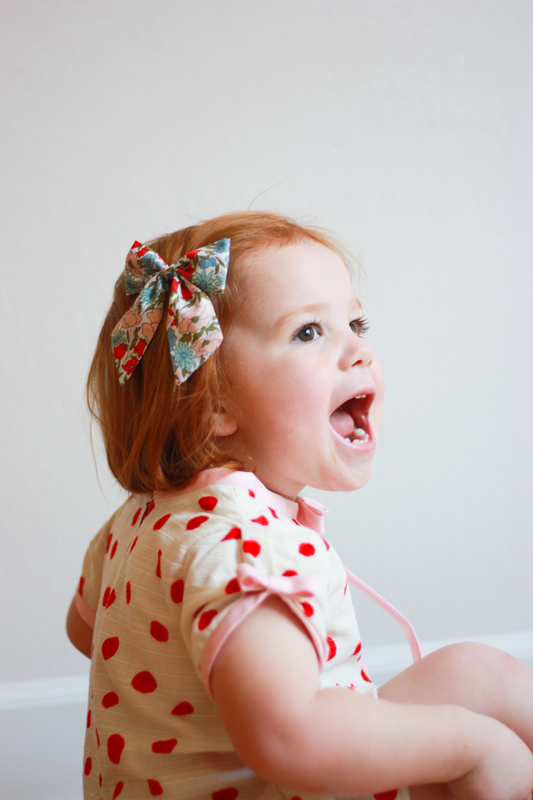 As is her red hair, which coordinates perfectly with every holiday! 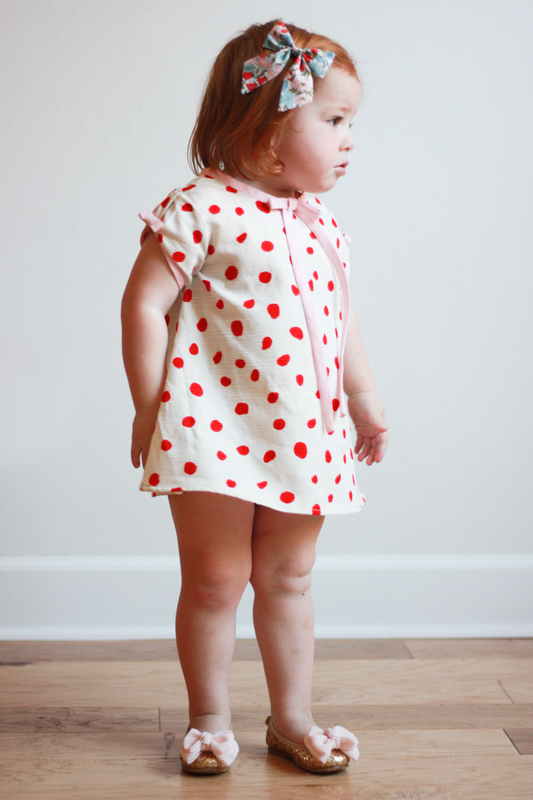 I bought the silk blend polka dot print at Dry Goods Design three years ago (before I was pregnant with Plum) thinking if I ever had a baby girl it would make a perfect Christmas dress. And then Christmas came and went both last year and this year, and I realized if I didn’t make something soon, it wouldn’t be enough fabric for her to wear anymore! 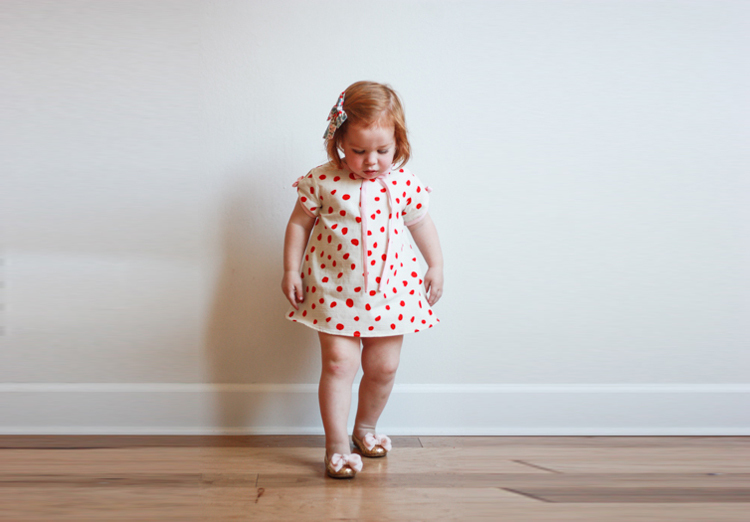 Luckily, Valentine’s Day and red polka dots go together perfectly. 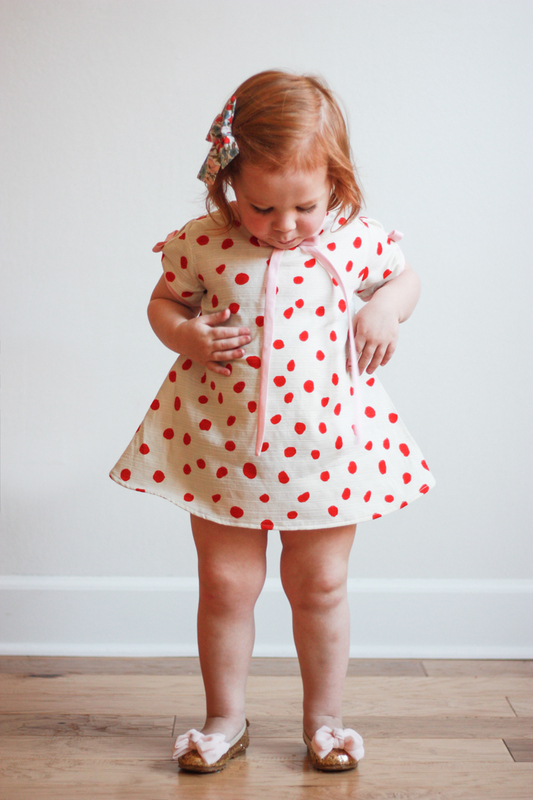 Because of her cute toddler belly, I imagined a swing style dress would fit really cute. I keep it cropped short– vintage Shirley Temple style– and added pale pink bias trim with flat bows on the sleeves and at the neckline. I know that everyone loves making homemade bias tape, but I confess I’d much rather keep a stock of store bought colors on hand for quick projects like this. 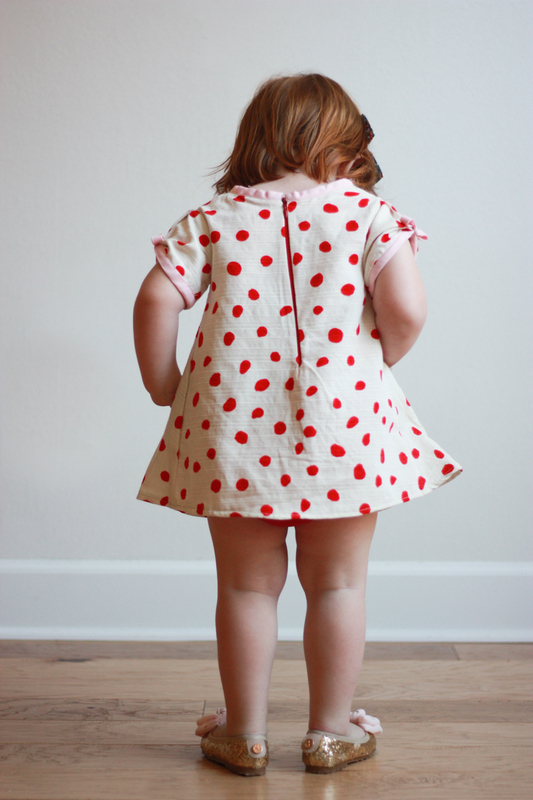 For the pattern, I started with my Big Bow Dress a-line pattern, cropped it short, then added sleeves. So, basically modified it from start to finish, which is typical for me. Rather than gather the sleeves into a puff, I made a single pleat at the shoulder seam, and then pleated up the center sleeve hem before adding the bow. Bias tape seemed the easiest way to add a design detail while finishing the neckline and sleeves without a facing, and the pink and red combo turned out perfectly. The closure is a simple invisible zipper, bit since it’s red a little contrast showing is pretty cute. Ooh, those chubby thighs are just edible. It’s becoming increasingly difficult to take a good photo of my kids, because they’re all so high-energy! Plum is definitely the most interested in modeling for me these days, although she likes to choose her own poses….like laying on the floor. Taking a little break. Ha! Gosh this girl makes me so happy! Her enthusiasm is contagious, and she’s smiling almost all the time. The cute floral bow came in the mail from my friend Hillary of Free Babes Handmade, and I knew it would be just the right touch for this Valentine’s Dress. 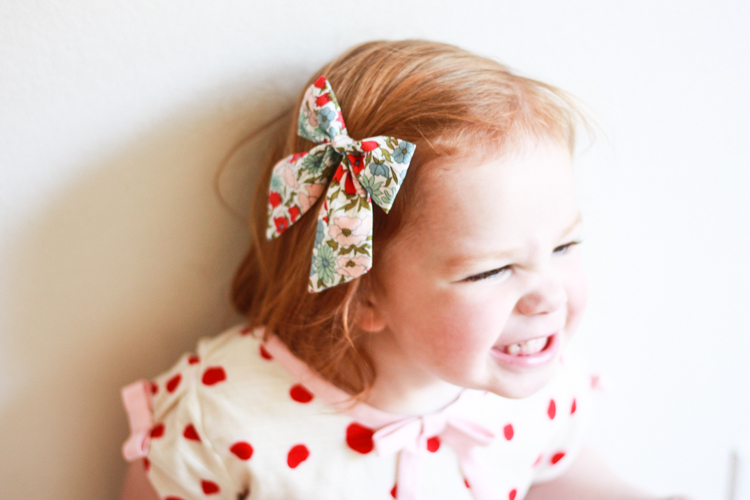 The red and pink combo plus a ditsy vintage floral print was absolutely perfect. All of my Free Babes bows have become instant favorites. They’re well made, gorgeous colors and patterns, and I am such a fan of Hillary herself, I can’t help but love her products! I feel the same way about Tana from Fox Paw Shoes, where these cute gold glitter flats are from. She’s a mom, designer, and shop owner with darling products. Plum has been wearing her shoes for a year now, and we love every pair. I’m going to miss Valentine’s Day this year, since we’ll be on our way home from a weekend away. So, I’m happy I grabbed some photos of her before I left to share. And I think this Valentine’s dress will be a favorite–at least for a couple more months while it fits!